And since Kyra is now on the War Priest path of Cleric, makes sense that her outfit is a little less dress and some pants. One of my favorites in the original line up and still awesome in this version. It looks like the larger equipment seen throughout the new versions is an intentional style change as are the palette and value range changes. Looks really nice although not sure about that um extra golden bit round the top of the sword sheath seems like it would get in the way of drawing the weapon especially with the way it's positioned in relation to her sword arm. She looks very bow-legged. Has she been riding around too long? I thought the same thing, she is very wide. This is my favorite of the 2.0s. 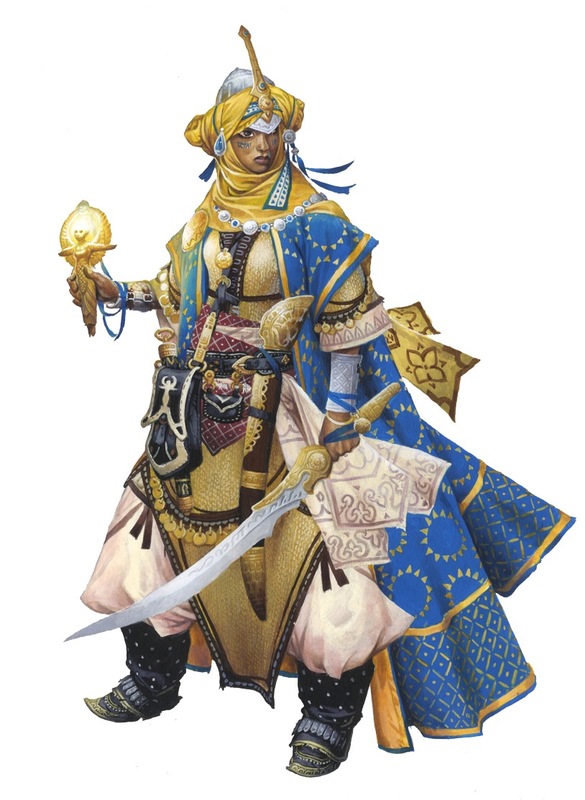 One request, can Paizo put the original art on the blog post as well so we can really see the comparison. Looks perfectly fine and relatively unchanged to me. Some proportions look slightly different, but only slightly, and some of that may be the different angle. I think between that and the baggy clothing they're doubling up on art to save money, and this is actually a portrait of Kyra and Lem. Is that a flute in her skirts, or is Lem just happy to see you? I am very excited about pants in Pathfinder 2nd edition. For one thing, since item slots are no longer a thing we have the possibility of magic pants which is a thing I have always wanted. Is new Kyra a Dwarf because with those pants its Hammer time! Nerds, make up your mind as to what kind of female body type gets your "Official Woman Can Go Adventuring While Looking Like This" stamp of approval. Unless you forgot to pack that stamp into your desert digital camo utilikilt or your electric cart. In which case, shame on you. I do not want to downplay the work of Wayne Raynolds, who is a big name in the industry. but recently I have not liked much more of his drawings. This kyra shows well what I do not like ... the feet are strange and the depropercionality between trunk and legs is something that I do not like. So she has a bit of a pear shape (not uncommon) and is wearing a lot of stuff around her waste and puffy pants. I also don’t think she’s too short, part of that is probably the angle it’s drawn from. It looks fine. People seriously need to quit being so critical and arguably spoiled. I’ve played plenty of RPGs with atrocious artwork, far worse than anything we’ve seen for PF2 so far. Or maybe it’s that everything else has been complained about so thoroughly that the artwork is all that’s left to be torn to shreds. Her clothing is fairly voluminous. I'm not at all sure how you can determine either of these things. Her stance is wide, but a lot of that is a reasonable posture, and wide hips are a thing to boot. This is not news. Wayne Reynolds, while IMO an excellent artist, has always had some oddly drawn feet. PF1 Kyra's feet are frankly odder looking, at least to me. and the depropercionality between trunk and legs is something that I do not like. How can you tell? Her outfit is such that I'm not even sure where her torso ends and legs begin. I mean, there's the belt, but she could be wearing that high, or low. Which is fine, some outfits have this effect, but I think it makes this complaint factually false, something one can rarely say about artistic analysis. If Pathfinder womens pants have pockets as standard, I would imagine most Pathfinder women would be very excited too. I'm gonna need an official ruling on just how many pounds/kilos of pickles a PC can carry in both standard cargo pants and in efficient cargo pants of holding. Wayne just needs to master drawing only poses where you can't see the feet. Reading the Amiri thread I keep thinking "Wow, and I thought the rules criticisms were brutal." Terrible RPG art has a very long tradition. Early D&D was full of craptastic art. As things went on, and production values rose we got some much better stuff. Smaller developers tend to have worse art, because they can't afford the best artists. Paizo is bigger than most, so their art tends to be very good, but some weird art still slips through. I don't count the PF2 stuff we've seen in this category at all, but clearly not everyone is a fan of Wayne Reynolds' style. Yeah, I remember hearing James Jacobs on Twitch a few weeks back making the correction that it's Kee-ra not Kie-ra, but it seems not everyone got the memo. I'm not sure I'm hugely into his newer style either, although for me it's more that the values are kind of flat. Which... could contribute to characters looking wider, now that I think of it. I do like the brighter colors and the pants, though. Also, even though it's still structurally the same, her headscarf seems more evocative of a hijab now, which IIRC was always the intent? So that's a nice touch. I like it, the shoes are a bit off but over all the poofier cloths make sense since she’s from a desert country. I don’t get why people are levying so many complaints about this...I know for a fact I could never draw anything half as this nice. Improves CMD (or whatever they call it in Pathfinder 2nd Edition). I want a variety to be able to participate. On the other hand, I'm really glad they didn't do the bearded dwarf women trope. I find it both silly, and helps reinforce the tired trope that beards are a major portion of dwarven identity. Seriously, that's a horrible thing for racial identity. If it was a combat stance I'd expect her to be less flat-footed. It's a little more like being on a surface that isn't entirely stable and trying to compensate for that - a ship's deck, for instance. This...seems an odd problem to have in this context. I'd assume around as many dwarven women have beards as human women, which is a decently low number of women. It's certainly not nonexistent, especially if you include all facial hair under 'beards', but I see no reason to show it on a Dwarf rather than a Human. Well, Dwarves make a huge deal about it for their men . . . .
Well considering it's been officially pronounced Kie-ra for around a decade, it's not easy to suddenly change the way you pronounce her name based on a decision made a month ago. That was my impression also. Maybe if Paizo posted the original version next to the new version, it would help. Art seems ok but it is me or the colors are way more flashy on this picture ?? LoL. I’ve always thought that since goblins are the Pathfinder mascot that the standard unit for weight should be the pickle. How many pickles (pkl) do you weigh? That said I'm loving Mr Reynolds' new renditions of the iconics. They're beautiful. And I really hope PF2's art production values stay this high, I've always thoroughly enjoyed the great art in Paizo's product lines. I named after the gelfling in Dark Crystal, for what it's worth. Which is why I've always pronounced it to rhyme with BEER-huh. I think the issue is that her feet appear to be further apart than the width of her shoulders, without anything dynamic in the pose to make it a reasonable stance to be in. Medieval Arabic clothing, especially for women, was just huge and poofy like that. Which is presumably the inspiration here. The art's not bad, it's well-researched. I for one like it. I like here new colours. I do feel her expression is very - I don't know, neutral? Non-plussed? She really seems disinterested in whatever is going on at the moment. Beyond that, yay for trousers! Next one should be Seoni, right ? I eagerly await and slightly dread her's. Sword seems a little wavier. I like that. Sarenarae's symbol is not so proud, and somehow her stance is more adventurer than apostle of god. Nice work as ever Wayne. Puffy pants are good, the change to the maile makes sense, and the details (you think feet are hard? try folds and billows of cloth....) are awesome. As for the shape, looks to me like she has a lot going on what with layers of gambeson, maile, shirts, pants, accessories etc and that somewhere under there is a woman with a figure. You and me both. I miss the pronunciation guide provided in the 3.5 version of the campaign setting to this day. That's a big win for team spite is it? Based on the sketch, I'm not even sure she is dressed 'modestly', just more modestly than previously. Which is fine with me, and I certainly hope, with most others. I love Seoni's new outfit. She doesn't look like a stripper, for one.